World record breaking Halifax Harriers athlete Max Burgin added to his growing list of achievements with 800m Gold at the European U18 Championships in Györ, Hungary. Spring Hall Sports Ground is the home of Halifax Harriers. Training is on Tuesday and Thursday evenings. 18:00 - 19:00 for Under 11s and 19:00 - 20:15 for everyone else. Halifax Harriers Athletic Club was formed in 1884. We are affiliated to England Athletics for Track and Field, Cross Country, Road and Fell running. We are dedicated to encouraging participation in all these disciplines for all ages and abilities and have a dedicated program for disabled athletes. 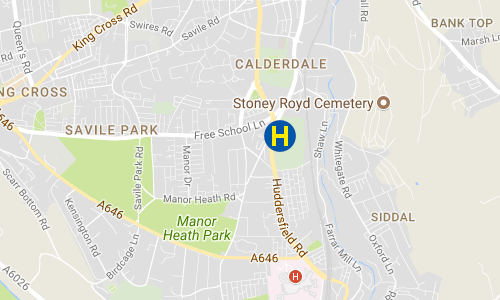 Our home base is the Spring Hall Athletics Track on Huddersfield Road, about 1 mile out from Halifax Town centre. The Flat Caps 10k saw Halifax Harriers Joe Crossfield triumph on this hilly course. Some runners described the route like a fell race on the roads. The route was certainly not one for PB’s. Joe Crossfield finished in a respectable time of 39:03 and first runner back. Cudworth. We will have a coach to this race, fare £3 on the day. We have a coach to the race and then we go for a pub lunch afterwards. Coach leaves Spring Hall at 6:30am. Everyone welcome from 8 years upwards. Training from an experienced coaching team. Our Race Clock is available for hire. Halifax Harriers have a thriving Junior section competing across disciplines.